This village lies in the river valley of Ramsey Creek with the area surrounding the village predominantly being attractive countryside with an intensive arable use. 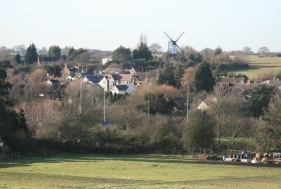 Ramsey has distinctive character of its own with development grouped around the sides of Ramsey Hill in a semi-circular fashion dominated by the now redundant windmill located on the hilltop. Despite the settlements small size, there are a variety of buildings of different ages ranging from 17th Century cottages in The Street, to suburban style houses and bungalows to the northern side of the village. The attractive quality of the original core in The Street has been designated a conservation area.